Substance abuse, including illicit and nonmedical prescription drug use, and alcohol, adversely impacts individuals, families, and communities. Stopping substance abuse before it begins can increase a person’s changes of living a longer, healthier, and more productive life. 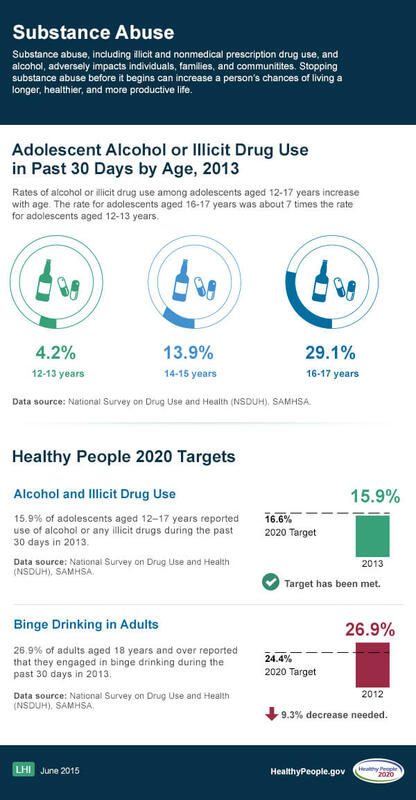 Rates of alcohol or illicit drug use among adolescents aged 12-17 years increase with age. The rate for adolescents aged 16-17 years was about 7 times the rate for adolescents aged 12-13 years. 15.9% of adolescents aged 12-17 years reported use of alcohol or any illicit drugs during the past 30 days in 2013. 26.9% of adults aged 18 years and over reported that they engaged in binge drinking during the past 30 days in 2013.